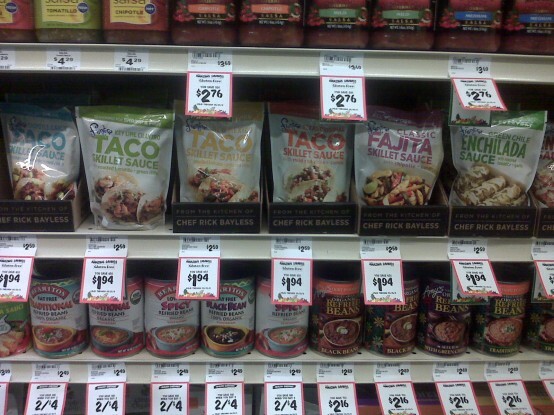 When I was in my local Sprouts grocery store last week, I spotted these new gourmet seasoning sauces by Frontera. 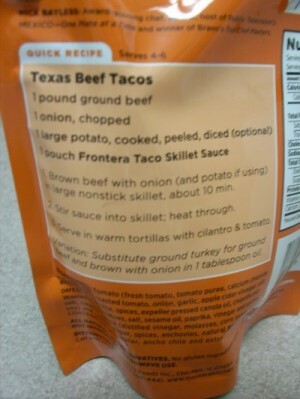 The line includes four taco skillet sauces, two enchilada sauces, and one fajita skillet sauce. 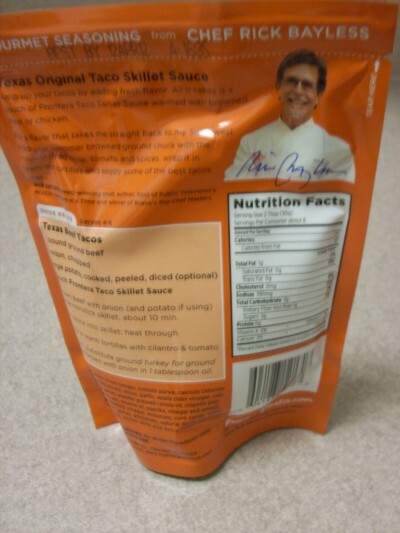 Award-winning chef, cookbook author, and restauranteur Rick Bayless is the creator of the Frontera line of food products. Hi Rick! I am already a fan of his salsas, so I decided to give one of the gourmet seasoning sauces a try. After going back and forth a couple of times, I finally chose this one. They happened to be on sale for $1.94 the day I got mine. When they aren’t on sale, they cost about $2.60 ( at my store anyway). So far, I think that I have only seen them at our Sprouts store. I’m not sure what other stores might carry them. They are available for purchase through the Frontera website. The packet says that this is for beef tacos, but on the back it says that ground turkey could be substituted as a variation. I had a package of extra lean ground turkey in the fridge that needed to be used, so I went with that. I browned the ground turkey, added some chopped red onion, then poured the sauce into the skillet. This sauce is made with fresh tomatoes, roasted tomatoes, onions, garlic, and chipotle peppers, spices, etc. I tasted the seasoned turkey by itself to check the seasonings. Ground turkey can be so bland, so I wasn’t sure if I would need to add any additional seasonings. The sauce gave the turkey a nice smoky taste, and it does have a very mild chile flavor, just like the package says. 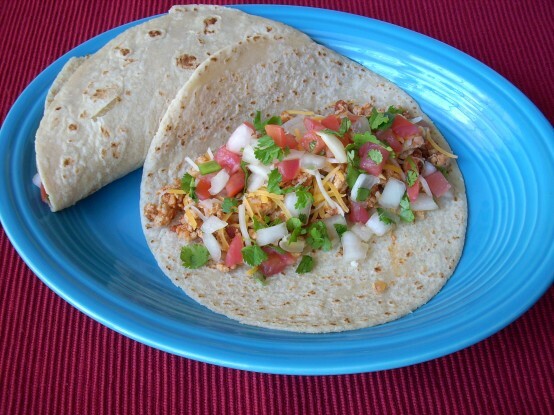 I had purchased some prepared pico de gallo and shredded cheese, so throwing the tacos together was a breeze. Baked tortilla chips and some of Pioneer Woman’s Restaurant Style Salsa (made the day before) completed the meal. Here’s what the final product looked like. 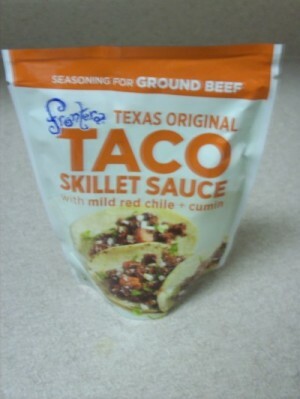 These seasoning sauces may not be something that I would use every week, but they are something that I would use again. I am curious to find out if the other flavors are as tasty as they sound. It would be great to have one or two on hand for those nights when I really need a quick and easy meal. By Tempie at May 18, 2011 .